Elements of computerized neural networks seem to respond in the same way as neurons in the brain’s visual system, researchers find. 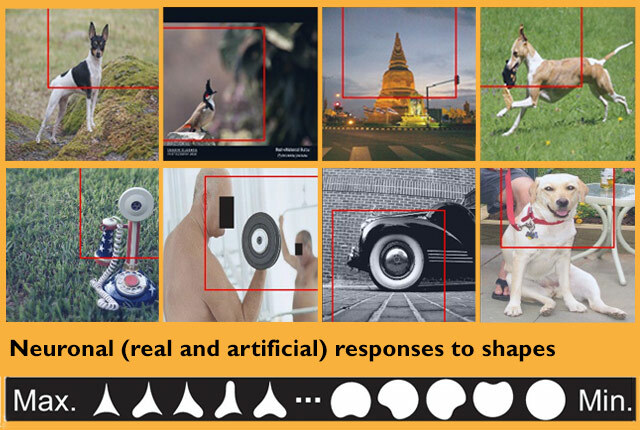 Like the V4 neuron, the artificial neuron responded most intensely to objects with a sharp points (top row) and least to rounded objects (bottom row). Bair and Anitha Pasupathy, both UW associate professors of biological structure, co-authored the paper with Pospisil. It appeared in the journal eLife in December. “It seemed like the behavior of single units of the neural network were converging on the behavior we saw in single neurons in V4 (the macaque's brain),” said researcher Dean Pospisil. Funding for the research was provided by the National Science Foundation (CRCNS Grant IIS-1309725), National Institutes of Health (R01 EY-018839), NIH Office of Research Infrastructure Programs (RR-00166 to the Washington National Primate Research Center) and a Google Faculty Research Award.